This is actually a ‘what I ate last Wednesday’, as my Mum was in town so we did all these lovely exciting things together. As usual, a big thanks to Jenn at Peas and Crayons for putting this all together. Again, I failed at the extra serving of veggies. 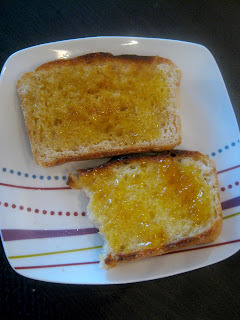 Breakfast was my homemade English Muffin Bread (recipe coming soon), which was amazing. I hope my mum was suitably impressed. I had three slices – one with apricot jam and the other two smothered with honey. As you will learn, I smother everything in honey. Especially cereal. We knew we were going to have high tea later that day, so we decided to have a really small lunch around 11. We went to the Shingle Inn, which is always great. We both had a ham and pineapple melt. Pineapple makes everything better – pizza, salad, sandwiches, desserts. 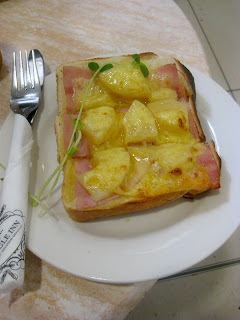 It was just one piece of thick bread with ham, pineapple and cheese. Yet, absolutely amazing. 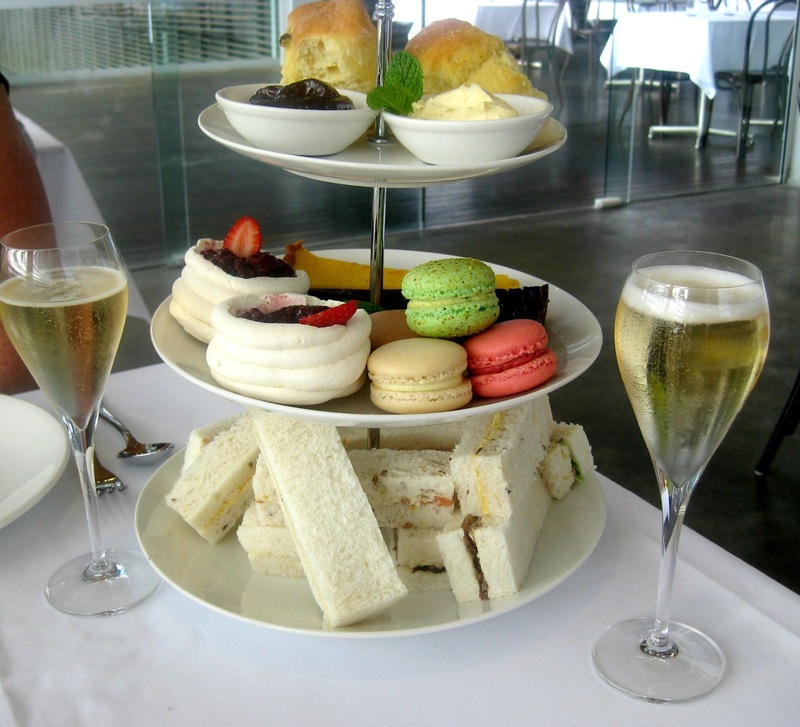 We pretty much just went shopping in the city all day until high tea at the GOMA at 2:30. Which was beautiful. There were five sandwiches – egg, chicken, roast beef, salmon and ham. I wasn’t the biggest fan of the egg or roast beef, but I made up for it by eating my Mum’s salmon sandwich. This was followed by meringue nests with raspberries and juice. 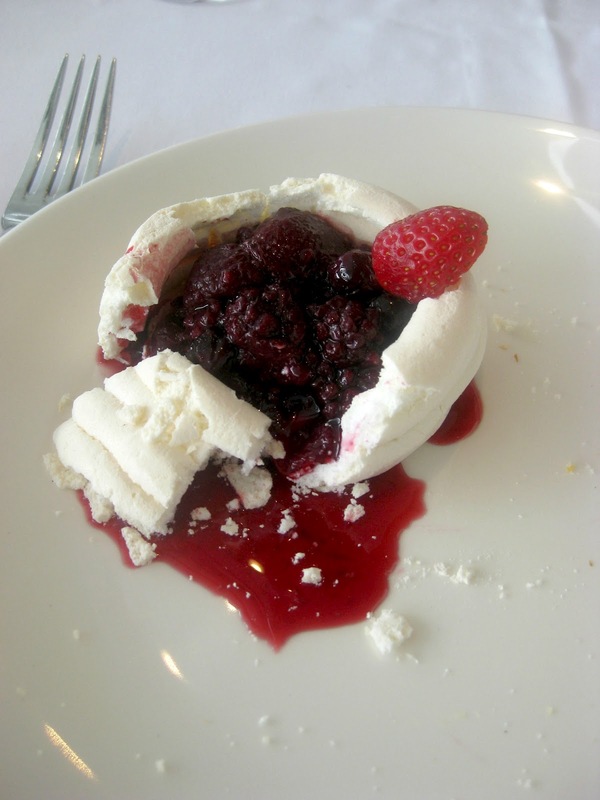 It was amazing – neither my Mum or I like meringue but it was fantastic – the best thing there probably. 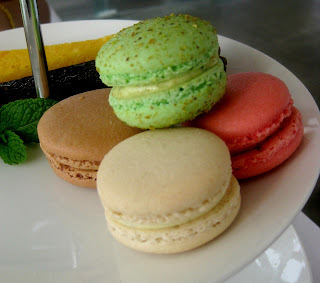 Then there were four macaroons – I had the coconut and strawberry ones while my Mum had the coffee and pistachio ones. They were also fantastic. 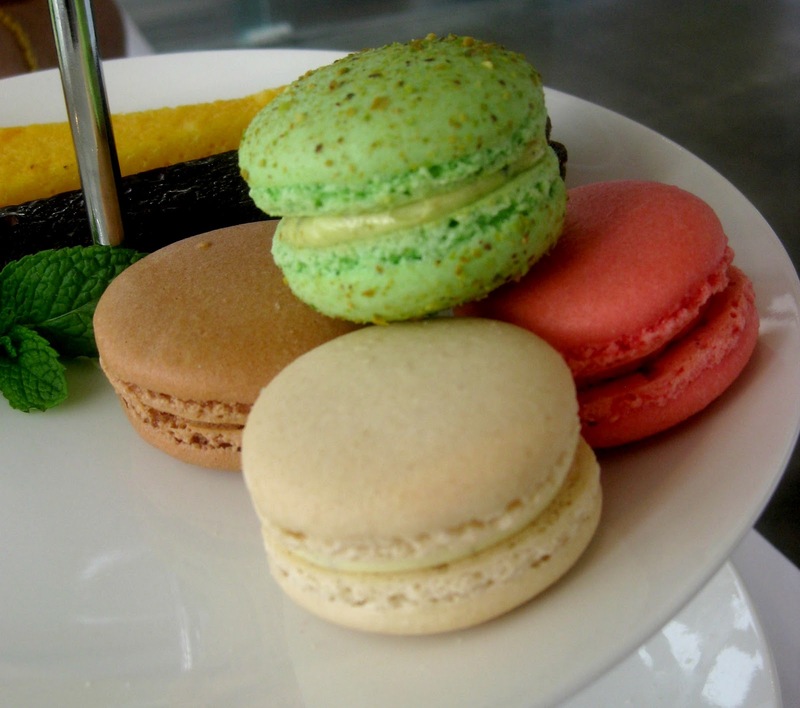 The lemon and chocolate tarts were a little disappointing – not as great as I had hoped. The scones – a fruit and a regular one – made up for it. And the strawberry jam was to die for. Neither of us were hungry after that for dinner, as it was such a filling, amazing meal. So I had an unpictured bowl of pasta with my grandma’s homemade sauce which she sent down with my Mum. And then a bowl of Weetbix, coated with honey of course. Both of these were very small, and pretty much only because I was tired, not really hungry (which is an awful habit and not one I indulge often). This wasn’t eaten that day but the next day we had lunch at the Bavarian Bier Cafe – warm, giant pretzels and schnitzel was eaten. 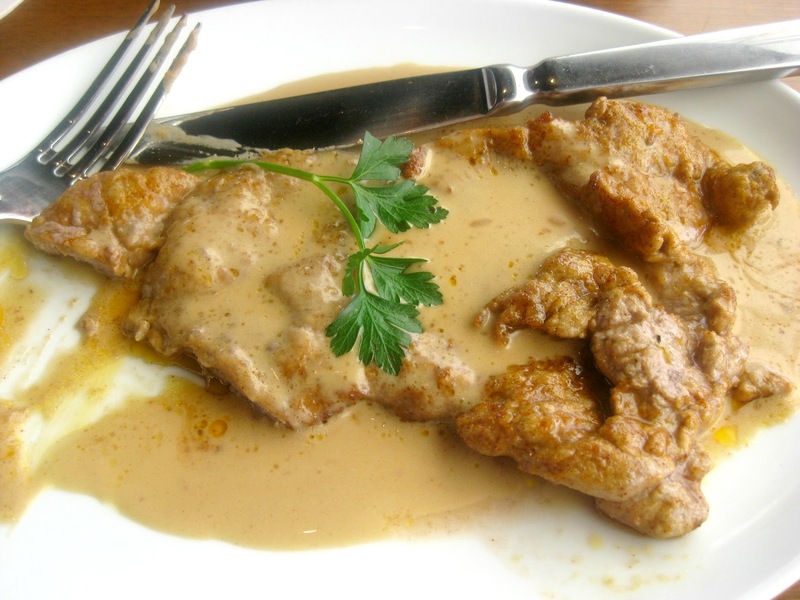 My schnitzel was veal and in a mushroom sauce. Let’s pretend you can’t see all the oil in the sauce. My side was ‘sautéed potatoes’ – pretty much bacon, onion and potato. You can see my Mum's meal in the background - schnitzel with ham and cheese. I also had an unpictured apple strudel – I ate it well before I thought to take a photo. 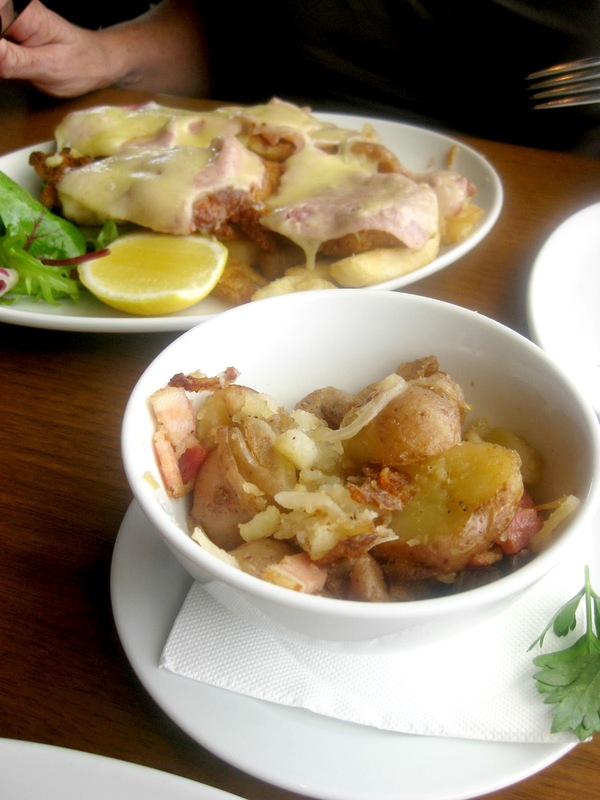 I had such a fantastic three days with my Mum – we just ate and went shopping and cooked. We spent Friday morning cooking her famous meat pies before we went to a late lunch. 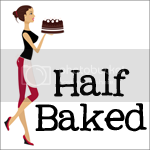 That recipe will also be coming soon. I would like to say, this was an off day for me. My life has been so crazy lately, and full of some really great food, that I just want to show you the great days, not the boring days full of oatmeal, salad and chicken. Today was so crazy for me. I woke up early to get to my internship on time, so breakfast was at 5:30. Then, because I had to go hand in my uniform because I quit my part time job, lunch wasn't until 1:30. I was hysterical - the crying kind of hysterical. And I felt awful. I don't think I ever go that long without eating. Never again. But on a good note - I did my first ever official interview! I interviewed an Australian fashion designer tonight - the interview lasted for about half an hour, she was incredibly lovely and she even said I covered everything. It was a good, albiet stressful day. And in other news - earlier this week I won the beautiful Shannon's giveaway - which I keep thinking and can't wait for. 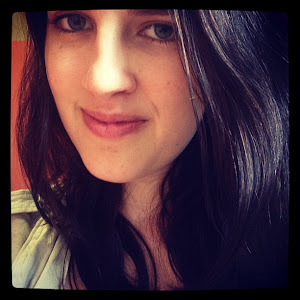 If you want to be inspired to eat healthily, but eat a good range of foods, and still maintain a great work/life balance - you should check out Shannon's blog - her blog is easily the one I look forward to reading most. And now I am off to check out all the other WIAW's. This is such a good day of the week. This High Tea business is just so neat to me! I have always wanted to do that and my mom and I are planning to sometime this summer in Boston :) We are going all out too.. dressing up in our finest and such!